The stuff of nightmares are limp slices of beetroot swimming in a bath of vinegar, which is the cooked beetroot most were used to growing up until beetroot took on a new status as superfood of the vegetable basket in Britain. Is it any wonder many stopped eating the pickled ones when roasting became the favorite way to cook these red beauties. Even boiled beetroot, though infinitely better than pickled was more or less cast aside. To get the full sweetness and nutritional goodness of this lovely vegetable, then merely roast it. 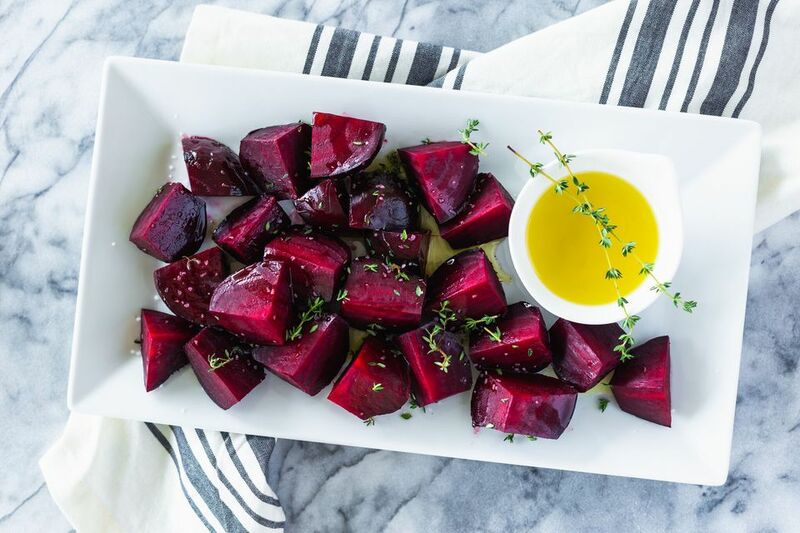 As you can see in this roast beetroot recipe, it is simple and straightforward, with the result, beets with an intensified sweet flavor with no compromise on the texture. Beetroot is best roasted with the skin on, which is easily removed once the beetroot is cooked. Take care not to break the skin when washing the beetroot and do not cut the roots off and leave at least 1”/2.5cm of stalk on the top. Carefully wash the fresh beetroots under cold running water and pat dry with kitchen paper. Cut away the leaves making sure you leave at least 1-inch of the stalk, preferably a tiny bit more. Take care not to break the skin, if you do, they will still taste good but will lose some flavor. Place the beets in a large, roomy roasting tin, sprinkle with the olive oil, roll the beetroot in the oil to make sure they are well covered. Finally, sprinkle with sea salt and the thyme. Bake in the preheated oven for 40 to 45 minutes or until the beets are soft but not shrunken. Remove the tin from the oven, then leave the beets to cool. Once cooled, rub the skin away with a piece of kitchen paper, it should come away quickly. Also, wear a pair of rubber gloves when you do this to stop your hands from turning red. Cut away the root and stalks and then use as desired. Roasted beetroot freezes well when chopped into cubes or slices. Put the beetroots into a zip freezer bags and freeze. They will keep extremely well for up to a month. When you are ready to use the beetroot, just remove them from the freezer and defrost slowly in the fridge. Use as you would the freshly roasted, you will not be able to tell the difference.